A medication commonly used to treat inflammation in rheumatoid arthritis could turn out to have useful treatment effects for patients with Alzheimer’s disease, according to a study published in Nature Medicine. Salsalate, a nonsteroidal anti-inflammatory drug (NSAID), appears to prevent the buildup of toxic tau protein in the brain. 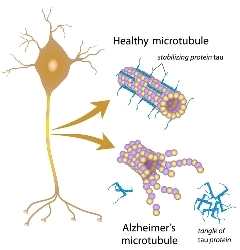 In addition to Alzheimer’s, harmful tau protein tangles are implicated in several other forms of neurodegenerative conditions, such as fronto-temporal dementia (FTD). This research on salsalate is notable because it targets the tau protein, rather than the more “popular” amyloid beta protein, which has received most of the research funding and clinical trials. As we have noted previously, the myopic focus on amyloid beta might turn out to be a costly red herring in finding an effective treatment for Alzheimer’s. A note of caution on the salsalate research: the current finding that this drug prevents buildup of tau protein in the brain is only in “animal models”, aka lab rats. Replicating this result in human trials will take quite a bit of time, money, and luck.